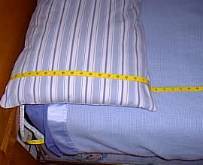 The following steps will assist you in determining the dimensions you need your quilt to be to have it fit your bed the way you want it to. 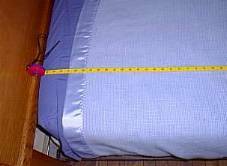 There are many different ways to place a quilt on a bed, and depending on how you "make" your bed, the dimensions of the quilt should vary. Two people make this a much easier task. Step 1: Make your bed as you would with all the linens and blankets that you are planning to use under the quilt. Remove any comforters or bed spreads that will not be under the quilt. 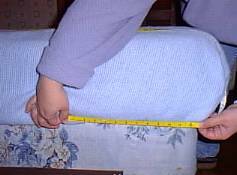 The number and sizes of blankets will effect the dimensions of the quilt. If you will vary the number of blankets seasonal, I recommend taking your measurements with the maximum number of blankets. Step 2: If you intend on having the quilt cover your pillows, place the number of pillows, along the top of bed as you would prior to placing the quilt on your bed. If the quilt will not be covering pillows remove them from the bed. 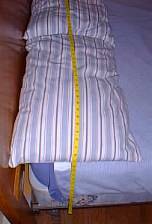 If you plan on having pillows covered by the quilt, you should measure the width up at head of bed covering the pillows as you go across the top of bed. (See figure on right.) Covering pillows adds to the dimensions of the quilt, but the extra width might not be acceptable on the lower parts of the bed, perhaps causing the quilt to hang too low. Therefore a compromise might need to be reached between covering pillows and the desired drop over the side of the bed. 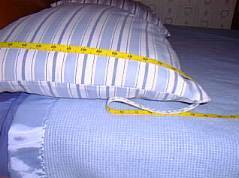 After taking the width measurement over the tops of pillows, check the width measurement over the middle of bed, to make sure the width would be acceptable for the entire of the bed. Step 5: There are four basic ways for a quilt to be placed over top of bed, covering pillows without tuck, covering pillows with tuck, or simply laid flat to top, or laid flat to top of bed and turned down. 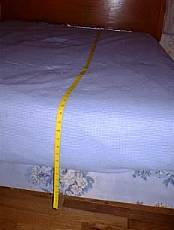 When taking this measurement be sure the tape doesn't shift from end of bed. Have the tape measure follow the same path that the quilt would. This would be the LENGTH measurement for the quilt. 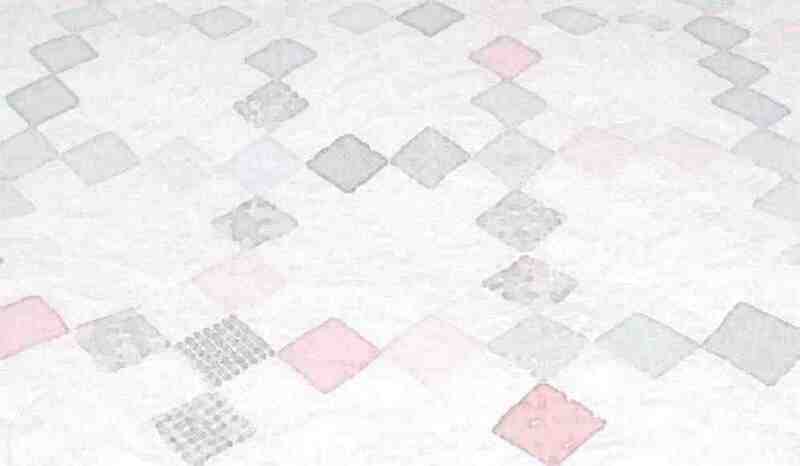 When selecting or designing quilts for your bed, take into consideration how you will be placing your quilt on the bed. How will the borders look? Getting the right design and fit for your quilt will make your quilt that much more attractive and enjoyable! I hope this helps.